Root vegetables, tubers, apples and warm spices are a perfect introduction to the soup season for me. I love making all kinds of soup when the weather turns colder and always enjoy trying new things. I've been toying with ways to make the classic Thanksgiving yams a little more unique, a little bit more refined and a bit more non-traditional just for fun. If you're inclined to do the same, then give this lovely soup a try. It's all of the above that and more but still works on the traditional holiday table. It's simple and hearty, a strong opener to a winter meal or a meal all on its own with some crusty bread or Indian flatbreads like paratha and naan. Experiment with the spices as per your taste, you will need a really sweet variety of apple to keep the spices from tasting too strong. You're aiming for bold flavors but not overwhelming; think balance. Here's the recipe and you can make it a day or two in advance, the flavor only gets better. 1. Heat the butter in a large saucepan and add the onion, garlic, ginger and fennel. Cover and cook on low heat. Sweat these aromatics about 5 minutes, until tender but not browned. 2. Add apples and yams and cook a couple of minutes. Season with kosher salt and black pepper. 3. Add the stock and simmer until the vegetables are fully tender and cooked through. Add the spices and yogurt and stir. Taste and season again with salt and pepper for a balanced and delicious taste. 4. 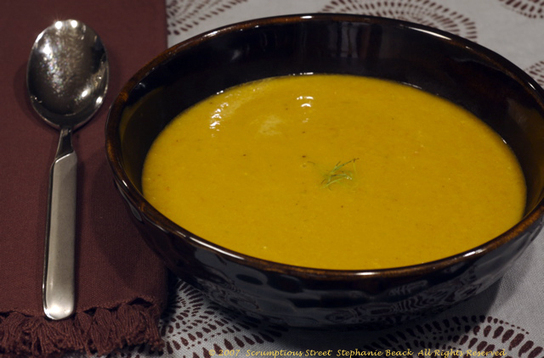 Let the soup cool slightly and ladle into a blender and puree to smooth consistency in batches. Add more stock to reach desired consistency and texture. Add the lime juice and season again. 5. Serve immediately or reheat if cooled too much and garnish with toasted coconut. 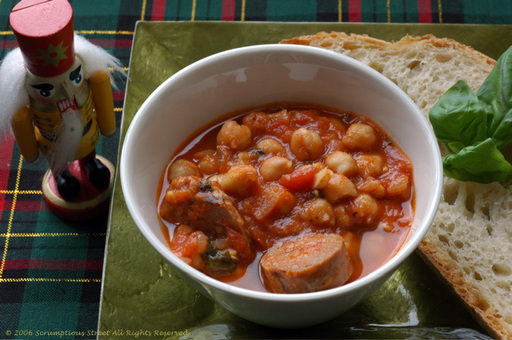 The cold weather is here and if you're anything like me, it's time to Get Your Soup On. I love a hot bowl of soup after a brisk, sometimes bracing walk home and this is a recent favorite. So much a winner, that I actually served it as the opener for my Thanksgiving dinner this year. It's lush, hearty, delicious and wholly satisfying. Here's my "Corn and Porcini Mushroom Chowder". It's perfectly acceptable to use dried porcini mushrooms in this soup, since you can't find them fresh anyway this time of year. Just make sure they are pale light brown and beige, not dark brown or black. Also for the corn fresh tastes best but frozen is also good. I can find it still with fresh cobs here in New York and you can in most places with Whole Foods or gourmet stores. Make sure that there's no other additives or preservatives if you're using frozen corn. You just want pure, natural and simple corn and we'll jazz it up with other ingredients. 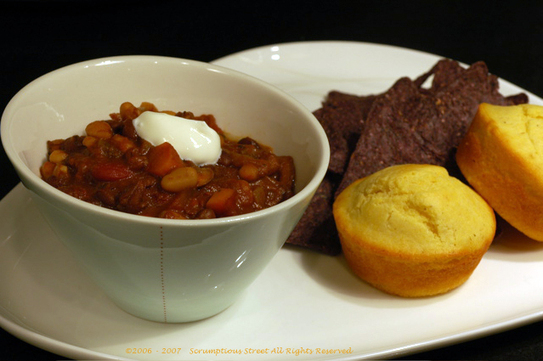 It's simple and hearty and one that made both Mr. Scrumptious and our friend mmmm and ahhhh. Matter of fact, this is one of those excellent soups that tastes even better the next day so make sure you have plenty for leftovers! 1. Put the porcini in a medium bowl and pour hot nearly boiling water over them until covered. Stir lightly to make sure all mushrooms are getting wet and set aside to steep. Heat the stock on a low simmer in a small saucepan. 2. In a large saucepan or medium stock pot melt the butter and add the onions and celery and cook on medium-low, sweating the onions until tender and translucent making sure they don't brown, about 6-8 minutes. 3. Add the flour to the saucepan with onions, butter and celery and stir to incorporate fully. Cook about 10 minutes, until a light blond roux is formed and the flour is no longer raw. Gradually add the stock and whisk to remove all lumps. Add the salt and pepper and simmer for 30 minutes. 4. Meanwhile strain the porcini mushrooms, reserving and straining half the liquid. Rinse the mushrooms and pat them dry, slice into thin long strips. Puree half of the corn in a food processor or immersion blender. Add the pureed corn, whole corn kernels, potatoes, bay leaf, porcini mushrooms, mushroom water and thyme. Simmer until the potatoes are tender, about 25-30 minutes. 5. Combine the cream and milk and add to the soup. Add the Worchestershire sauce and cayenne pepper. Taste and adjust salt and pepper if necessary. Serve immediately. I'm still on my "thrilled to live in Artichoke-land bender" and am continuing to make good on my promises to prepare them any way I can imagine. This one was inspired by Duarte's Tavern in Pescadero, CA and their famous and fantastic artichoke soup. I tried to create a recipe that I would guess (but I don't know for sure) is pretty close to Duarte's and then merged that with my own favorite party dip. My delicious and peppery "Baby Artichoke and Pepperoncini Soup" was the delightful result. 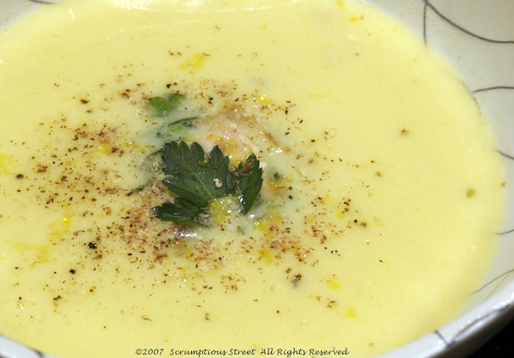 The pepperoncini are the star of this soup and really make it something unique and surprising because of the spice and tang they contribute. The soup isn't hot, but definitely peppery and lemony. It's a very refreshing taste, even when served hot and steaming. 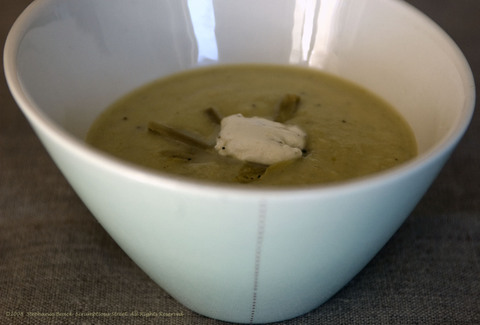 Most artichoke soups are cream-based and while I often enjoy them, I find creamy soups in the heat of summer are a little too decadent. So, this one is a very light and healthy recipe as well. Great news if you're more a nibbler in the summer months! It would also be a yummy first course at a dinner party. Something to get the taste buds firing and ready for action but also interesting enough that no one will forget it! Again, freshness is very important here and Baby Artichokes are quite polarizing. They can either be terrific or awful and you need to use the terrific ones here to make sure the texture of the soup is silky rather than stringy. Mine came from a wonderful local farmer's market, of course. Also, make sure to trim the baby artichokes all the way down to the very light yellow hearts and leaves. If you retain any outer leaves that are too fibrous and would need to have the flesh scraped with your teeth like full-size artichokes, then remove those tougher leaves and set aside and do not puree them in the food processor. You can save them for a sandwich or just nibble on them while you prepare the soup. But, it's imperative that you only use the tenderest of leaves and inner hearts. Baby artichokes should have an edible choke; they aren't hairy and prickly like mature artichokes. (After all, they are a thistle!!) Before pureeing, just make sure to slice the artichokes in half and double-check the chokes and soft and smooth. Here's my recipe, feel free to improvise of course! 1. Fill a large pot with 2 inches of water and add 1/2 tsp. kosher salt, 1/4 tsp. black pepper, the garlic, 2 T. olive oil and the lemon slices. Place a heat-proof footed colander or steamer basket inside the pot and put the trimmed baby artichokes inside. Turn the heat on to medium high and bring the water up to a gentle boil. Place a lid over the colander and pot and steam the artichokes for 15-18 minutes until fork-tender. When ready, remove the colander and the artichokes and slice each artichoke in half, removing any tough outer leaves and checking the choke is soft and edible. Remove the lemon slices and reserve the artichoke stock. 2. In a food processor, pulse the artichokes until a nice paste begins to form. Add in the shallots, the garlic from the cooking stock and the pepperoncini and pulse again to mix. Add another 1/2 tsp. kosher salt, 1/4 tsp. black pepper and the half-lemon juice (about 2 T.). Puree until very smooth. Slowly drizzle in the remaining 4 T. olive oil and puree until smooth and rustic, but free of lumps or fibers. 3. Transfer the artichoke and pepper base to a large saucepan or medium stockpot and heat on medium low. Add the reserved artichoke stock and another 1-2 cups water, depending on desired thickness. Taste and season accordingly. Slowly bring the soup up to steaming, but not boiling. Remove from heat immediately. 4. Garnish with julienned artichoke leaves and a slice of fresh goat cheese. I think, alas, it might finally be time for Spring in New York. It's been a wild ride, this winter, and I am fully embracing the rainy season that carries the sunshine on its heels. I'm saying farewell to winter, and the last of the hearty and comforting soups of this season with my Minestrone. Minestrone, can be boring, delightful or surprising. One of the great things about it is that it's simple, but we get out of it exactly what we put into it. With love, attention, fresh ingredients and showers of flavor with sprinkles of seasoning it can be a great transition meal. The one that carries us from April showers into May flowers, heats us up after a walk through the rain but isn't so heavy that it lulls us into the winter drag. From here on out, my soups will be bright, fresh and light, so use this one on a rainy day or if you're in the Southern Hemisphere like many of my lovely readers, then here's a great start on your winter soups! Me? I'm ready for the sun on my face, flowers in my pot, herbs in my planter and delicate chilled soups. 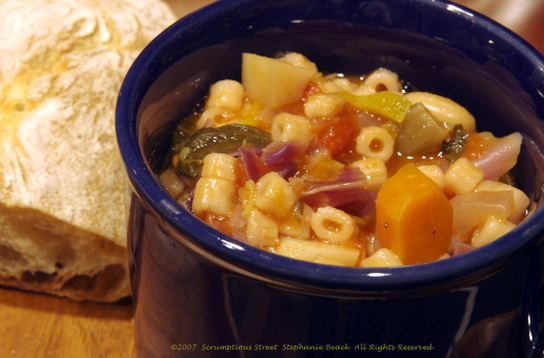 Here's my recipe for "Seasons Changing Minestrone." 1. Take out a large, heavy-bottomed stockpot or enameled cast iron pot and heat the olive oil over medium heat until shimmering. Add the onions, leeks, carrots, celery, potatoes, garlic and herbs and cook stirring occasionally, until the vegetables start to soften. About 5 minutes. Add the cabbages and cook, pour in the white wine, stir in the tomato paste, season with salt and pepper and cook until cabbages have softened and wilted, about 10 minutes. Reduce heat to low and cook another 10 minutes. 2. Add the cannellini beans, tomatoes and parmesan rind. Add enough water to cover the vegetables by about 2 inches. Bring to a boil, then lower the heat, cover and simmer about 35 minutes. 3. Add the pasta, stir to incorporate, cover and let simmer another 7-8 minutes. 4. Turn off heat after soup has cooked and pasta is done. Squeeze 1/2 lemon directly into pot and stir. Ladle the soup into large bowls, serve with a crusty bread and enjoy! This soup is not your typical hearty winter stew, thick and creamy soup or stick-to-your-ribs fare. It's a vegetarian's delight and excellent choice when your meal will gradually work to heavier dishes. Bugs Bunny would like it. If you like curried flavors and interesting twists on familiar ingredients, you will also like it. If you want a chunky soup that eats like a meal this one won't fit the bill. However, if you're serving four courses, want to break up monotony or have a vegetarian at the table who is sick of compromising on flavor and depth, this is the soup to serve. It's my "Roasted and Curried Carrot, Ginger and Fennel Soup". I made this soup as an exercise in utility, usage of existing ingredients at home and simplicity turned unique. The roasting of the vegetables in advance really develops the flavors and intensifies the vegetal taste. This aspect is not for everyone. If you're a grazer who likes raw veggies too, this will work well for you. 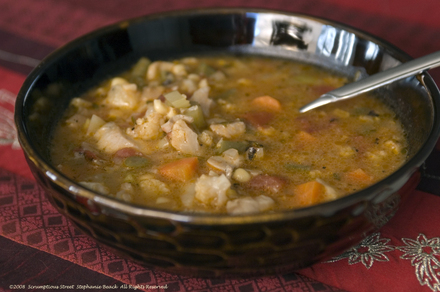 If Irish Stew is your version of soup heaven, I won't be offended if you skip this one. The carrots are sweet and intense, the fennel also becomes sweet but delicate and the garlic adds a roasted almost nutty flavor. 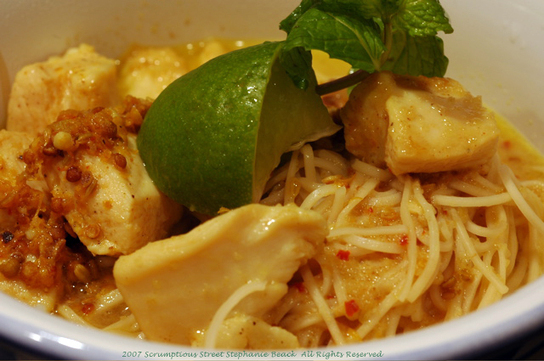 The spices perk it up without dominating and the coconut milk smooth and balance the result to a pleasing flavor. One note: make sure you use low-sodium broth here. If you don't you may not need any salt at all to finish it off. 2. Spread the carrots, fennel and two cloves of whole garlic on a rimmed baking sheet into an even and single layer. Drizzle with the olive oil, sprinkle with cumin and kosher salt depending on the broth you intend to use. 3. When oven is preheated, place the baking sheet in the center of the oven and roast the vegetables and spices for 15 minutes. Make sure not to let them go dark brown or black. You should pull them out just after your home has this incredible aroma of curried spices and the vegetables are soft and very lightly caramelized. 4. Remove the vegetables from the oven and let cool about 5 minutes. When cool enough to touch, squeeze the garlic cloves from their skins and mash with a fork gently. 5. Add the roasted vegetables including garlic and spices to a food processor fitted with the metal chopping blade. (You could also use an immersion blender but it would be best to put the vegetables in your soup pan, add the liquids and then blend.) Pulse the food processor to puree the vegetables well. Add the ginger, ground coriander and 2 1/2 c. vegetable stock to food processor. Fit on the lid and switch to "on" pureeing until the vegetables and stock make a fine puree. You could also strain through a strainer or chinois if you desire, for a very elegant texture, but I let mine tend toward rustic. 6. Pour the puree into a sauce/soup pan and turn on medium-low flame on the stovetop. Gently heat the base until steaming and hot but not bubbling, about 10 minutes, stirring at least once every minute or so. Add the remaining cup of vegetable stock and heat again to steaming, another 3-4 minutes, and stir again. Taste and season with kosher salt and black pepper as desired. When ready, add in the coconut milk and stir to incorporate. Bring back up to steaming, another 2-3 minutes and then immediately remove from heat and serve. This would be excellent followed by a hearty lamb or beef dish, maybe some homemade spaetzle too? When Mr. Scrumptious and I first got married, he told me about his wonderful childhood friend whose parents were Greek. Every Sunday afternoon their family would have a delicious soup and Mr. Scrumptious loved it so much he'd magically appear at their home Sunday evening around dinner time. He described it as a very basic soup with leftover roasted chicken, rice, broth and lemon with a few light spices. He explained its simple delicacy and creaminess. I did a little research and a little improvisation and seem to have re-captured that soup perfectly in my own recipe. According to him, it's just as he remembers and every once in a while (although not every Sunday) the craving hits. Here is my "Greek Chicken and Lemon Soup". 1. Separate the egg yolks from the whites and put in a small dish. Whisk gently or beat with a fork. Cut the leftover chicken into small pieces. 2. Heat stock in 2qt. saucepan until steaming. Homemade chicken stock is best but if you don't have it, make sure to use fresh stock or broth. (Do NOT use bouillon or mixes.) Stir in the lemon juice and zest. Add the rice and chicken and heat. 3. Whisk ¼ cup of stock into the egg yolks to temper then quickly whisk mixture back into the stock on the stove. Heat gently, stirring occasionally, until steaming, about 2-3 minutes. 4. Pour into serving bowls and sprinkle with pepper and nutmeg if desired. I added parsley here for the photos but I don't usually include it in the recipe. Enjoy this one on a cold winter's day, or when you're feeling under the weather for maximum delight! If anyone out there is Greek, I'd like to know how close my version is to an authentic recipe.